In honor of Evacuation Day St. Patricks Day in Boston I couldn't resist posting these green Harvard tee shirts. I saw them in a window display at the Coop in Harvard Square. It seems almost unnatural that the famous Harvard crimson would change to green. I wonder if this means their football team will now be known as "The Green" instead of "The Crimson." They're cute. But I don't there will be a name change! Thanks for coming by Cedar Key today! One of the most elegant blogs on CDP! I really like yor photos. It is great that so many fellow photo bloggers selected green for the day in very different in creative ways. I am impressed that you recall absinthe from reading Hemingway. Hemingway drank a lot of everything I think. We once made the mistake of staying in this great hotel in Madrid Spain that was advertised as adjacent to Hemingway row, which were all of the bars he visited. This means heavy part row and no one sleeps. When I got up the next day people were still at the bar or sitting on the street sick from drinking too much. I cannot imagine drinking too much absinthe though. It is high in alcohol content, but very smooth and obviously must inspire artists at a different level. 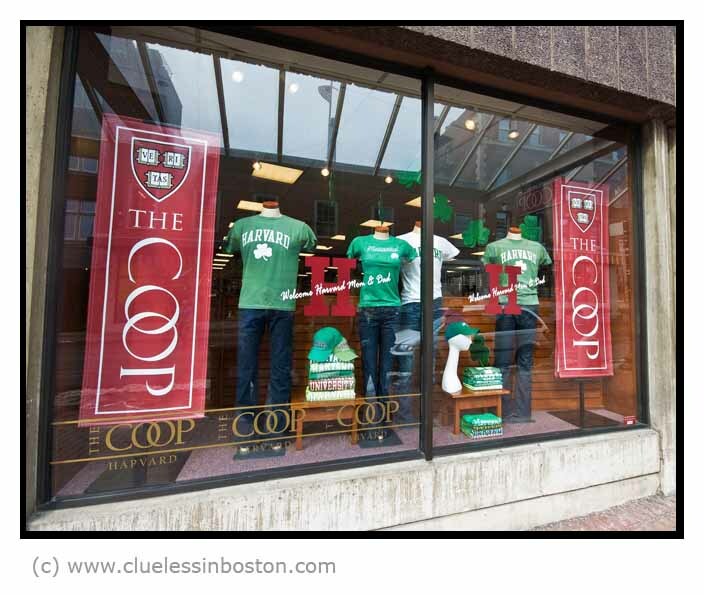 Clever post - nothing says Boston on St. Paddy's like Harvard - decked out in green! Hope you had a fun day. You should know by now that every thing turns green on Paddy's Day.